Navien NPE-180A Premium Condensing Tankless Gas Water Heaters are high efficiency condensing tankless water heaters from the stable of Navien. They are built for outdoor and indoor installation depending on need. It has a flow rate of 8.4 gallons, a BTU of 15,000-150,000 and built for wall installation, hence suitable for people short on space. It has a minimum temperature range of 98 and a maximum of 140 degrees-Fahrenheit. Two stainless steel heat exchangers: this ensures you have steady supply of hot water. The stainless exchangers effectively eliminate the chances of experiencing fluctuations in hot water. Cost effective: since it is gas or propane powered, Navien NPE -180A makes use of existing ½ gas lines. This is readily available in most homes. It saves you the additional cost of installing new lines. Secondly, you also save on electric bill which can be so high. 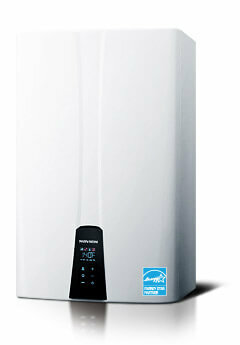 Saves precious space: the tankless water heater occupies just about 80% of space. Less space than what the 50% gallon tank water heater takes up. This frees space for you to use in your home. Factory in-built temperature control switch; this feature comes with an LG display. It is located at the front of the water heater. Helps you monitor the water temperature, make necessary adjustments and detect defects easily. A Built in control feature for multi-unit system: this makes it possible to merge various units into a system at no cost. You need not buy extra elements and features. There is a Navien Ready –link cable. This effectively does the cascading of units when need for hot water becomes high. Ability to convert to propane: Navein 180A tankless water heaters are built to run on natural gas but can also easily change to propane gas if you want. It comes with a 15 years warranty on the two stainless steel heat exchangers. Professional installation: the installation is little bit complicated and hence needs a professional plumber to do it. From all indications Navien NPE-180A Premium Condensing Tankless Gas Water Heaters are indeed highly efficient tanklesss water heaters. They give value for money spent on it despite its short falls. These short falls are negligible when compared to the numerous benefits they offer.